If you’ve read any of my past reviews, then you know lemon is my absolute *all-time* favorite scent. I love it! 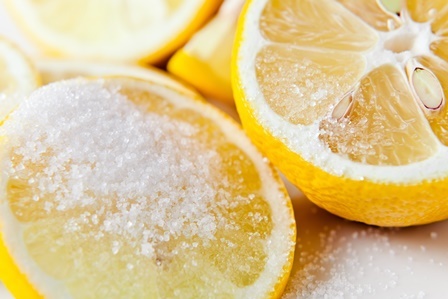 I enjoy all variations… sweet lemons, bakery, fresh, zesty. I love them all. And Lemon Ice from Gold Canyon smelled amazing. Like the sweetest lemon drenched with sugar. It wasn’t really lemonade but more of a lemon candy. Cool. Refreshing. Citrusy. Notes of Lemon, Orange & Vanilla Ice Cream. 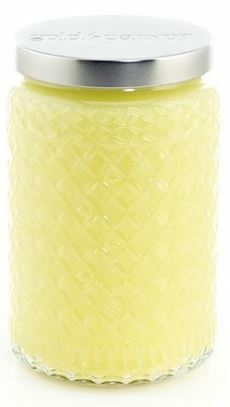 I couldn’t smell any orange in this scent… just sweet lemon and yes… vanilla!! That was the sweet element I deleted. Mmmmm!!!! I loved it. I really wanted to enjoy every moment of this fragrance so in my master bedroom it went. Once the wicks were lit, it took 15 minutes or so to reach a full melt pool and from that point on, sweet lemon and vanilla filled my bedroom and it was PERFECT!!!! Lemon Ice smelled like lemon drop candies with swirls of vanilla. Sweet as can be and a room filler as well. Lemon lovers… I highly recommend this one. I’ll be purchasing it again for sure. Strength – I would rate this candle an 8 out of 10 in a very large room. It wasn’t knock your socks off strong in a large room but still gave a steady medium scent throw. 10+ in a medium to smaller rooms. I was very happy with the strength of this candle. Lemon Ice burned perfect. Zero wick issues. Clean burning from start to finish. I did have to trim both wicks each day before re-lighting them but that’s fairly normal. Someone recently asked me, why do I trim the wicks on my candles every day? My answer is… for a few reasons. Trimming your wicks eliminates sooting, it keeps the flames from becoming torches and your candle burns more efficient and lasts longer. Some candles you don’t have to trim the wicks but the majority you do. Every candle is different. I loved Lemon Ice and plan on purchasing a few more before summer ends. Yeah, I liked it that much. Lemon lovers… this one is a must try if you love sweet lemons. Boy did this candle meet every expectation I had. Ready to take the plunge and try a Gold Canyon Candle? You have to purchase through a demonstrator so if you don’t have one already, go to Gold Canyon’s site and order online. They’ll automatically choose the closest one for you or will give you several choices to choose from. It’s easy. I’ve also found sellers on Ebay which was an easy transaction too. That be it for now… lots more Gold Canyon reviews coming your way so stay tuned! Lemon Ice from GC is one of my all-time favorites! I agree with everything you said on your review. I always describe it like the smell of lemon bars baking 🙂 I am actually a consultant for Gold Canyon as well, and if anyone hasn’t tried GC before, let me know because I can hook you up with a 20% off your first purchase. Feel free to email me at natalie.n.moritz@gmail.com and check out the full GC website at nataliemoritz.mygc.com. I love, love lemon scents also; I was disappointed in the Yankee Sicilian Lemon. This scent sounds wonderful..another day, another candle! Out of my two recent orders, I’ve only burned 2 so far and both were pretty good. We’ll see how the other ones go as I burn them.